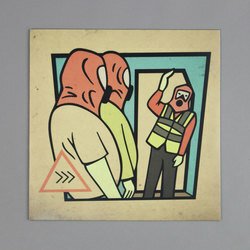 Beak> - >>>. Vinyl LP, CD. Bleep. Following a string of killer singles over the past few months, Beak> arrive to take us on their latest motorik venture into the outer edges of electronic, rock and everything in between, with the brilliantly unpronounceable >>>. 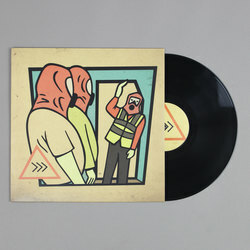 Written over the course of a year and recorded live at Geoff Barrow’s Invada studios in Bristol, it finds Beak> channelling the truly mind-boggling heights of their collective recording dynamics pushing onward through their own genre of oddness. 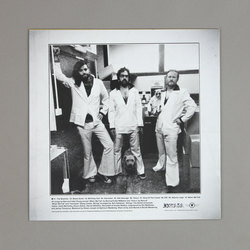 While it’s no secret we've long been fans of the electronic formulas that Beak> have conjured up over each new release. While each member of the group has been plugged into great successes in past, present and previous projects, the Beak> project to our ears feels like the times when bandmates Geoff Barrow, Billy Fuller and Will Young take some time to hit the record button and properly let loose with an entwining sequence of sounds that draw from a collective pool of influence: post-punk and rock, Kosmiche and Krautrock, library, techno, hip-hop and into electro. Elements of each genre evolve in and of the mix, always perfectly in time and pushing in the only direction Beak> will offer, forward. Sharing psychic space with contemporary groups like Cavern Of Anti-Matter and much of the Ghost Box and Finders Keepers crews, Beak> are notable for being able to time travel between the new wave and dip backwards into the lineage of originators Amon Duul II, Laurie Anderson, Morricone, Julee Cruise et al. All cut and pasted with a wide-screen cinematic edge that calls to mind the exceptional recent year's soundtrack work of group leader Geoff Barrow. This discipline really lets each track on >>> truly expand into its own universe, from the restrained jazz groove of 'Brean Down', to the proper having it synth jam flirtation of 'Allé Sauvage' easily one of the best tracks on the album and what could be a lost science fiction soundtrack from the 1980s updated with tomorrow's world and studio techniques. On 'Teisco' they seemingly channel both The Stooges and Mika Vainio at his most reduced for a bubbling bassline led lesson in minimalism before the closing track seems to plucked out of thin air a delicate folk ballad with 'When We Fall'. Ticking the box for everything from hypnotic jams, minimal synth, pulsating drums and above all else some exceptional grooves to get nicely stuck into for days on end, >>> is sure to reassure any that step onto its path that Beak> are one of the true innovative electronic groups operating in the present and guiding us toward the future.